Examples, videos, worksheets, stories, and solutions to help Grade 6 students learn how to convert metric units of mass. The following diagram shows the conversion chart for metric units of mass: kilograms, grams, centigrams and milligrams. Scroll down the page for more examples and solutions. How to convert between grams, kilograms and tonnes? 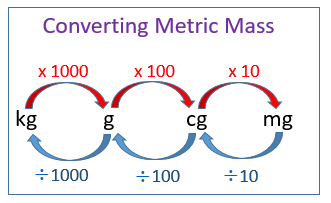 How to convert metric units of mass by marking the decimal and then moving it, using the larger left rule in one case, and the smaller right rule in another.